Print Student Progress Reports (Term Grades) and Report Cards, send to parents at midterm and end of term. Make sure you are in full year mode not quarter or semester (See term to the right). Search for the students you wish to include in the print job. 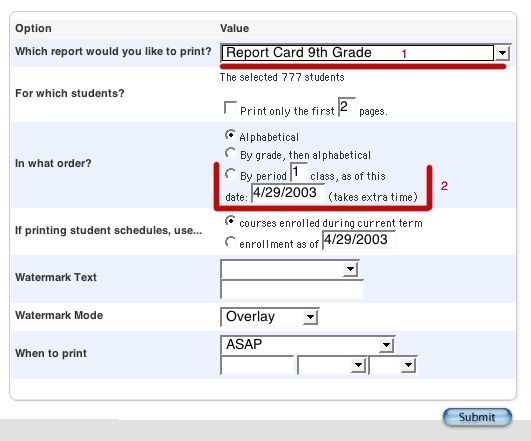 Usually All if you are printing Report Cards. Choose Print Report from the functions pulldown. 1. Choose the report you wish to print. It will be located in the second group of reports. 2. 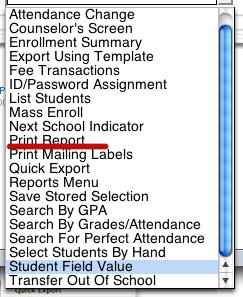 Choose the third option to print the reports sorted by period. Choose a watermark if you wish. You can set large reports to print after school hours ant they will be ready to in the morning. It will take a while to generate a report (so overnight isn't a bad idea). Click Refresh, to see when the report is complete, click complete, to print. The report will open in Adobe Acrobat Reader. Make sure there is enouth paper in the printer to print the report cards.